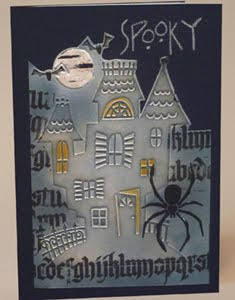 Love this embossing folder and that Dreamweaver spider. The Gothic lettering is a rubber stamp by Quietfire Design. great visual. I love the gothic lettering boarder. very cool haunted house. I love the hint of yellow in here.